Synthetic peptide of phosphorylated (Ser139) human Histone H2A.X. HeLa heat shocked cell lysate for Western blot. Our Abpromise guarantee covers the use of ab26350 in the following tested applications. WB Use a concentration of 1 µg/ml. Detects a band of approximately 16 kDa. IP Use a concentration of 12.5 µg/ml. 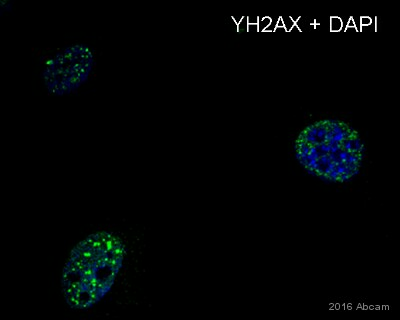 In situ hybridization Use at an assay dependent dilution. Immunocytochemistry/ Immunofluorescence - Anti-gamma H2A.X (phospho S139) antibody [9F3] (ab26350)Zhang X. et al PLoS One. 2016 Feb 26;11(2):e0150175. doi: 10.1371/journal.pone.0150175. eCollection 2016. H2AX phosphorylation and cell viability after ssUV irradiation. 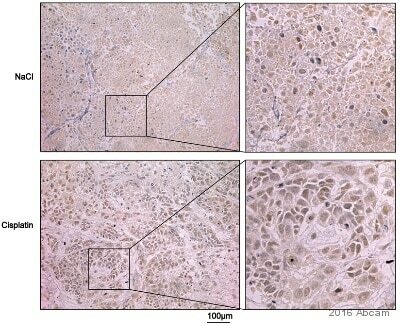 ssUVR induces γH2AX in human keratinocytes. 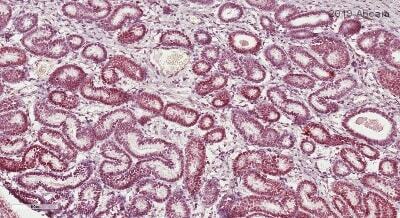 HaCaT cells were exposed to ssUVR at 0, 3, 12, 18 J/cm2, the levels of γH2AX was determined at 1 hour after irradiation. Representative image. Cells were seed in 6-cm cell culture dishes. On the Next day, cells were exposed to various doses of ssUVR (0, 3, 12, 18 J/cm2). At 1 hour after irradiation, cells were fixed with 100% cold methanol at -20°C for 15 minutes, and permeabilized with 0.2% Triton X-100 for 10 minutes. 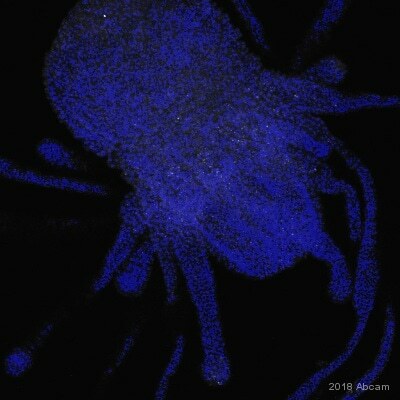 The cells were then blocked with 3% BSA in PBS for 1 hour at room temperature, and incubated overnight at 4°C with γH2AX monoclonal antibody (Abcam, ab26350). After three washes, cells were incubated with the secondary antibody conjugated with Alexa Fluor 488 (Molecular Probes) for 1 hour at room temperature. The cells were mounted with Prolong Diamond Antifade reagent containing DAPI (Molecular Probes). Images were acquired using Leica SP5 Confocal microscope. The intensity of γH2AX signals was quantified using ImageJ. 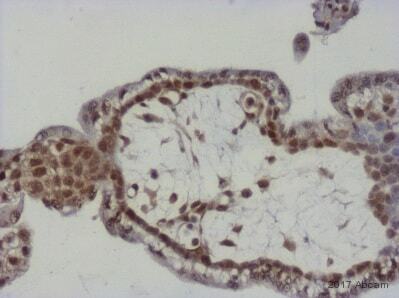 Immunohistochemistry (Formalin/PFA-fixed paraffin-embedded sections) - Anti-gamma H2A.X (phospho S139) antibody [9F3] (ab26350)This image is courtesy of an anonymous Abreview. 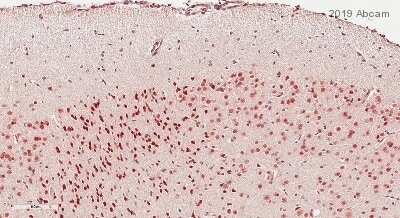 Ab26350 staining H2A.X in Human placenta tissue sections by Immunohistochemistry (IHC-P - formaldehyde-fixed, paraffin-embedded sections). Tissue was fixed with formaldehyde and blocked with 5% BSA for 30 minutes at 22°C; antigen retrieval was by heat mediation in a citrate buffer. Samples were incubated with primary antibody (1/100 in TBS) for 16 hours at 4°C. A diluted Biotin conjugated Goat anti-mouse polyclonal (1/200) was used as the secondary antibody. ab26350 (1/500) staining gamma H2A.X (phospho S139) in HeLa cells (green). Cells were fixed in paraformaldehyde, permeabilised with 0.5% Triton X-100/PBS and counterstained with DAPI in order to highlight the nucleus (red). For further experimental details please refer to Abreview. 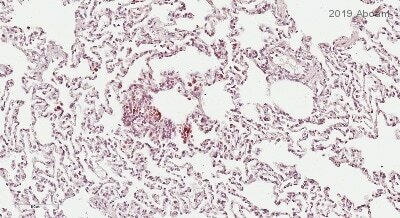 ab26350 (1µg/ml) staining gamma H2A in human spleen, using an automated system (DAKO Autostainer Plus). Using this protocol there is strong nuclear staining . 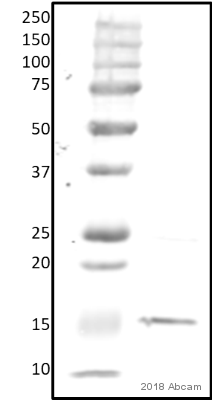 Overlay histogram showing HeLa cells stained with ab26350 (red line). The cells were fixed with 80% methanol (5 min) and then permeabilized with 0.1% PBS-Tween for 20 min. The cells were then incubated in 1x PBS / 10% normal goat serum / 0.3M glycine to block non-specific protein-protein interactions followed by the antibody (ab26350, 1μg/1x106 cells) for 30 min at 22°C. The secondary antibody used was DyLight® 488 goat anti-mouse IgG (H+L) (ab96879) at 1/500 dilution for 30 min at 22°C. Isotype control antibody (black line) was a mix of mouse IgG1 [ICIGG1], (ab91353, 1μg/1x106 cells), IgG2a [ICIGG2A], (ab91361, 1μg/1x106 cells), IgG2b [PLPV219], (ab91366, 1μg/1x106 cells), IgG3 [MG3-35], (ab18394, 1μg/1x106 cells) used under the same conditions. Acquisition of >5,000 events was performed. 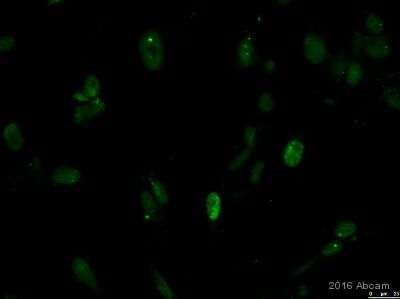 ab26350 staining gamma H2A.X in pig spermatocytes by Immunocytochemistry/ Immunofluorescence. Cells were fixed with formaldehyde, permeabilized with Triton x100 and blocking with 0.15% BSA was performed for 30 minutes at 250C was performed. Samples were incubated with primary antibody (1/100: in PBS + 0.15% BSA+0.1% Tween 20) for 12 hours at 25°C. 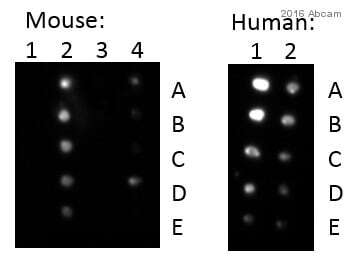 An Alexa Fluor®488-conjugated goat monoclonal to mouse IgG was used at dilution at 1/100 as secondary antibody.